Do you want to learn to play the piano? Looking for the right piano teacher for beginner piano lessons in Brighton? Or perhaps you are already playing and are looking for intermeidate or advanced piano lessons in Brighton with an experienced piano tutor? How about getting in touch with one of our experienced piano teachers! Learning to play the piano with the piano teachers at MusicTutors.co.uk is a great idea. Our piano tutors are skilled and experienced teachers as well as professional musicians, who have all been approved by our team through a stringent recruitment process. Whether you are looking for piano lessons in Brighton for beginners, or intermeidate piano lessons, we can find the right piano tutor for you! Flexible Solutions for Piano Lessons in Brighton at MusicTutors.co.uk! At MusicTutors.co.uk we understand that life can be crazy. That's why many of our piano tutors are willing to travel to your own home to offer piano lessons in Brighton, and some piano teachers offer the option of learning in a studio/rehearsal space. The sky is the limit when it comes to tailoring a learning experience with our piano teachers that meets your ambitions and needs for piano lessons in Brighton. We understand that for some people, learning to play the piano is something that needs to happen at the same time, same place, every week. 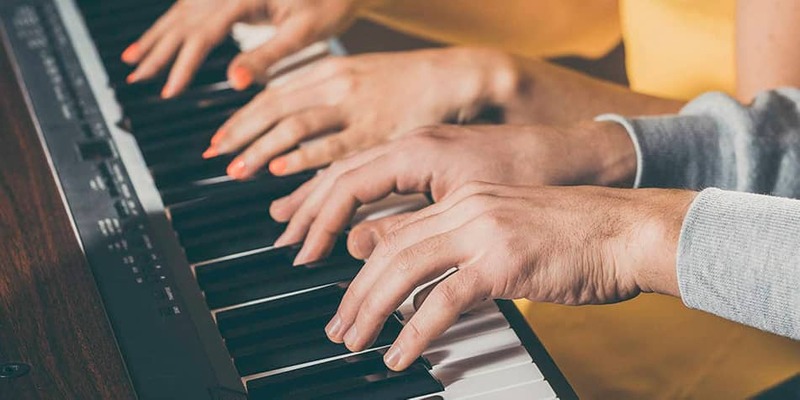 In this instance, our team of professional piano tutors will be able to provide piano lessons in Brighton for you to fit in with the spaces you have in your schedule. However, we also understand that for other people, shcedules are more fluid and piano lessons in Brighton will need to happen at different times duting an ever changing schedule. Our team of high-quality piano teachers can also work your piano lessons in Brighton into this kind of schedule as well at no extra charge! musictutors.co.uk wants as many people as possible to be able to enjoy learning to play the piano and so we offer piano lessons in Brighton with a professional piano teacher as flexibly as we can! Safeguarding and child protection are amongst our core values. It is our aim to bring the same level of background check and security that you'd see in a mainstream school into private one-to-one piano lessons. All of our piano tutors hold an Enhanced DBS certificate before they can teach piano lessons in Brighton with us. This allows for a sense of security, and a relationship built on trust between piano student, piano teacher, and parent during the piano lessons in Brighton. Do I Need My Own Piano for Piano Lessons in Brighton? There are multiple things to take into consideration when purchasing a piano – should I buy an acoustic or digital piano? Upright or grand piano? How much do I need to spend? Here are some things our expert piano teachers recommend you take into account when choosing your piano. Your piano lessons in Brighton will be so much more meaningful if you have the right piano to practice and perform on. Our piano teachers say the sound of a digital piano is produced electronically, so it does not need tuning. This can save you money in the long term, leaving more resources free for extra piano lessons in Brighton! One piano teacher comments that most digital pianos have the option of plugging in headphones. This way, you will not disturb anyone while playing, and you don't have to feel self-conscious about practising before your piano lessons in Brighton! There will often be a metronome built-in which can help you practise playing in time. Often, your piano tutor will like you to practice scales and exercises and even pieces on the piano alongside a metronome. This dramatically increases your sense of time, pulse and rhythm - crucial skills for anyone learning to play the piano. The metronome helps bridge the gap between practice and piano lessons in Brighton, where your piano teacher will be there to guide you on these important skills. Most digital pianos are lighter than acoustic pianos and are easier to transport – some can even be disassembled. For the gigging pianist, a stage ready digital piano, complete with weighted keys and stand but without the traditional cabinet associated with the piano is considered a standard piece of kit. For your piano lessons in Brighton, a stage piano will be OK if you are short of space in your own home. If you go to a tutors studio for your piano lessons in Brighton, more often they will have a cabinet to go with the weighted keys of the instrument. Ask your piano teacher for more information. The sound of a digital piano is created electronically rather than mechanically, so the player has less control over the tone produced by the piano player. In the beginning stages of learning to play the piano, this may not matter so much. However, your piano teacher may comment that the greater the demands of the piece or the longer that the student has had piano lessons in Brighton, the more likely the piano student will find frustration with the electronic reproduction of piano tone. For other piano tutors the type of instrument doesn't matter as much as the time and focus spent playing it! The action (how the keys respond and feel) on a digital piano is lighter than on an acoustic piano. This can make it difficult to transfer your playing to an acoustic, and can mean your piano technique isn't as developed. On this note - it's definitely worth paying enough to get a digital piano with weighted keys, that way at least it will feel more similar to an acoustic piano. A piano tutor at musictutors.co.uk will be able to pass down a wealth of knowledge and experience on technique in your piano lessons in Brighton. Learning to play the piano is much a physical task as it is is a mental or musical one. Understanding the action of your own piano is a crucial part of learning to play the piano and developing a solid technical basis is one of the core reasons for seeking out the right piano tutor for your piano lessons in Brighton. Your piano teacher will be able to lay out a plan for improving or embedding a good music technique in your first piano lessons in Brighton. Practising technique is best done on an acoustic piano - the creation of tone depends on your control and finger strength together with the balance in your forearm. Your piano tutor will be able to advise you on this in your piano lessons in Brighton and offer a range of exercises designed to improve and automate this ability. If you were blindfolded, do you think you would be able to tell the difference between a beginner piano student and a professional piano teacher doing something as simple as playing the note middle C? Perhaps unsurprisingly you would! Technique and the way you approach playing even the simplest of things on a piano is a life times worth of hugely enjoyable work, something made all the more so by enlisting the services of a piano tutor for your piano lessons, someone to be by your side during the trials, tribulations and celebrations on the journey of learning to play the piano. Our biggest tip in this article is to enjoy piano lessons in Brighton with a professional piano teacher. As your piano teacher will tell you, acoustic pianos need to be tuned. This should always be done by a professional piano tuner. It's worth considering this added cost. When your piano is new, you should have it tuned at least twice a year for the first two years, and after that just once a year,regardless of how often you practice piano or have piano lessons in Brighton. Your piano teacher may well be able to point you in the direction of a great piano tuner. Acoustic pianos are more expensive than digital pianos. Although the burdgeoning second hand market in pianos and the increase in popularity of digital pianos means that occasionally a bargain can be found, more often an acoustic piano of quality will cost more than a digital equivalent. Your piano teacher will be able to recommend a local dealer or music store who can help advise on the best places to purchase an acoustic piano near you. It's not unusual to discuss a prospective piano purchase in piano lessons in Brighton. It's an important decision that will also have an impact on future piano lessons so your piano teacher will want to make sure you make the right decision! In modern piano stores, the instruments are seldom more than 10 years old – and therefore in good shape. How much a piano wears over times varies greatly. There are some makers who are known for their quality e.g. Steinway, Bösendorfer and Fazioli. These are worth considering. If you are buying a second-hand piano it is more likely to be an older instrument and you should be aware that the price is likely to match the condition of the piano. It is still possible, if looked after, to learn to play piano on an instrument 50 or even 100 years old. The key thing is understanding the maintenance and tuning history of the piano as best as you can. Your piano tutor will be able to advise on the tone and general condition of the piano you're looking at in your piano lessons in Brighton and many of our piano tutors will be happy to spend some time assessing the quality of the instrument you have chosen to learn to play the piano on. Ask your piano teacher for specific advice when you need it. Price Range 3: Grand piano. Price range: £5000-£50.000 Grand pianos are wonderful instruments if you have the space in your home. Here you get a whole extra range of tone and volume, by adjusting the lid. Our piano teachers love giving piano lessons in Brighton on these instruments but they are by no means essential for piano lessons to take place. Piano Lessons in Brighton Not for You? Brighton is often described as London by the sea - and for good reason! The city is jam-packed with amazing music, arts and culture with something for everyone to enjoy. There are many great musicians to have come from Brighton across many genres including The Kooks, The Levellers, Rizzle Kicks, British Sea Power, Bat for Lashes, and Blood Red Shoes. Brighton’s music scene is buzzing and vibrant with an eclectic mix of venues. The biggest venue is the Brighton Centre which regularly hosts huge concerts from big names. Another larger venue is the Brighton Dome. For lovers of smaller venues, you'll want to check out places such as Komedia, The Hope and Ruin, and the Concorde 2, a club venue right on the picturesque seafront. Brighton also hosts a diverse range of festivals such as The Great Escape, The Brighton Festival where you can immerse yourself in Music, Art and Theatre. There’s no feeling better than playing live with other musicians. This will enhance your skills as a musician as well as lessons from a high-quality professional music tutor. Luckily, there's a range of great amateur groups that you can get involved with. The Brighton and Hove Concert Orchestra is an amateur group formed over 50 years ago that regularly rehearses and performs in the local area. Similarly, The Brighton Chamber Choir are a group of singers who perform everything from Classical to Broadway Musicals. Whatever style of music you enjoy, it is so important to play and enjoy music with other musicians. For those looking to get their first instruments or an upgrade on their current one, there is a fantastic selection of music shops that can help and guide you on your journey. GAK is a fantastic place to find your perfect guitar, bass, drum kit and live sound equipment. David Ingledew Pianos is a fantastic place for grand and upright pianos. Finally, Hobgoblin Music is a great place to search for acoustic instruments such as violins and violas, and Ackerman Music has a stunning selection of Classical instruments and sheet music. If you have any unanswered questions about piano lessons in Brighton, contact MusicTutors.co.uk - we are always ready to assist. We love helping match students with their perfect tutor. You can contact the office all weekdays between 10:00-16:00 by ringing us on 07946125613 or you can send us an email any time to [email protected]. We're looking forward to hearing from you!